This post is featured as part of Election Month here on Tableau Public. When it comes to elections, there is now data everywhere about everything. Campaigns drag on for months, even years, and all that activity generates data about everything from word usage in speeches to the the number of miles flown by a candidate, to the number of doors knocked on by an advance team. One of the most persistent and important sources of elections data that deserves careful analysis is the candidates' financial data. I'm not talking about tax returns; I'm talking about how much money the candidates are raising, and how they are spending all that money. 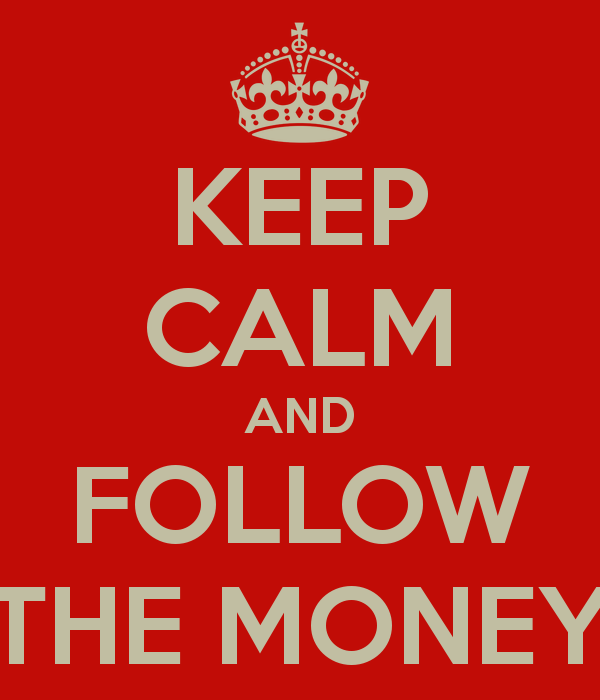 A wise man once said: Follow the money! And in our federal election system, what with the Citizens United law in place, this has become an increasingly important part of any election cycle. Digging through the raw data for candidates on the Federal Election Commission page can be downright impossible. Fortunately, we can help guide you. The FEC page contains an incredible amount of great data, but the website is archaic and can be hard to navigate. To find spending and fundraising data, go to the Data Catalog. That's where you can access different metrics and data sets for various years and candidates. Downloading any of these will give you a really large file to work with. Connecting the FEC data to Tableau can help you immediately see what's what. You can analyze how different candidates both raise and spend their money. When first looking at the data, it might be interesting to start with a personal view of the data. In my case, for instance, I wanted to know whether anyone from my company, Tableau, gave money to any of the candidates. I also wondered whether people from my neighborhood contributed. These questions are fairly basic and can really go a long way to connecting you, or anyone, to this data. But you can't ask those basic questions anywhere on the FEC website. Downloading the raw data in Excel won't make the answers jump out, either. For that, we need Tableau. Consider this dashboard, created by our own Ben Jones. 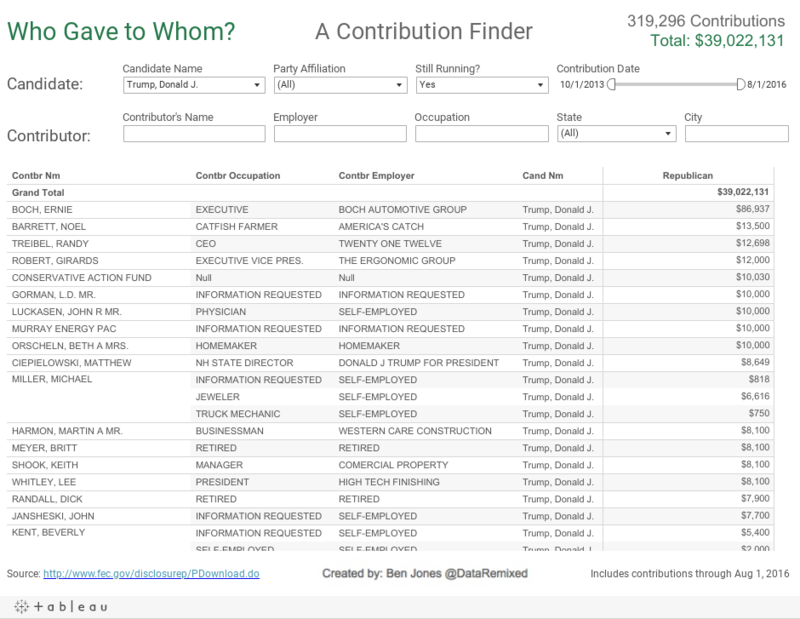 Ben has created a portal into the candidates' contribution data. You can filter down to the exact cross-segment of the data you are interested in. This is one of the fundamental benefits of Tableau: Allowing for access into data that, without Tableau, would be inaccessible. With Ben's viz, seen below, you can dig in and analyze this large data set in any way you'd like. You can even search for a colleague or neighbor by name. On the flip side of the financial spectrum is the candidates' spending data. How exactly is each candidate spending his or her hard-earned donations? We can also leverage the power of Tableau to better analyze and understand the raw data files taken from the FEC. 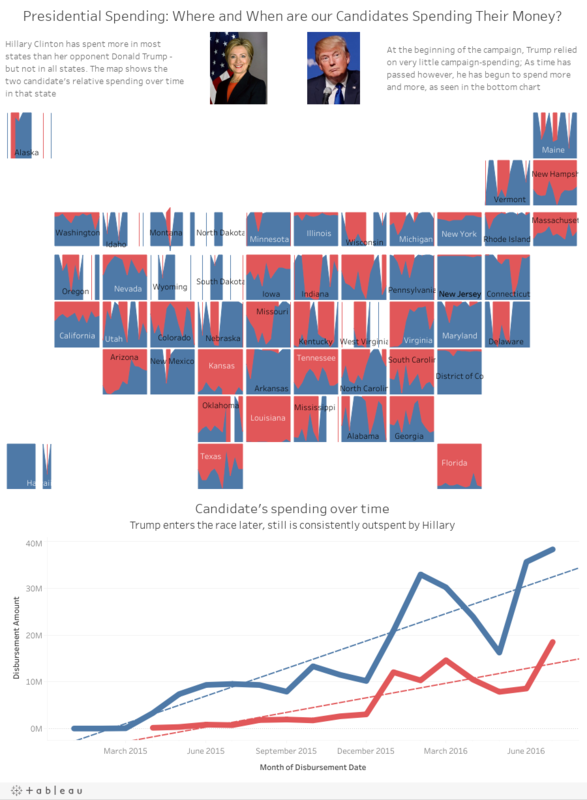 In the dashboard below, which I created, you can see how our two presidential candidates are employing different spending strategies in different states. You can also see that they invest in different types of outlays, and their spending patterns have differed greatly over time. Elections data offers many great opportunities for exploring and understanding even the largest and most complex of data sets. Analyzing the financial data of political candidates can lead to so many insights and important stories. Luckily, by visualizing our data, we have the opportunity to find those key insights. For more tips on telling stories with your election data, check out our on-demand training. Visit our #ElectionViz gallery for inspiration, and tweet us your viz @tableaupublic.